A dish similar to this was found in a 13th century Arabic cookbook called the Baghdad Cookery Book. It is believed that the recipe travelled all the way to Greece. Thanks to its journey, today, moussaka is probably the best known of all Greek dishes. It is basically a baked lamb, eggplant and tomato casserole that is layered and is then covered with a deliciously creamy thick layer of bechamel sauce. It is then baked till it is golden and crusty. The dish comes out of the oven sizzling and bubbling around the sides. I like to rest it for half an hour before I cut into it. This allows all the layers of juices and flavours to settle down. When you serve it, you still have layers of mince and vegetables all oozing with their delicious juices. The aroma is so appetising, it is enough for one to break all diets and barriers and dive into this divine dish! Like all other things, recipes of moussaka too have evolved. There are many variations and recipes ranging from the purely vegetarian with different veggies like potatoes, zucchini etc to the healthy with chicken mince instead of lamb to the sinful which is everything like it originally should be! This is comfort food at its best. 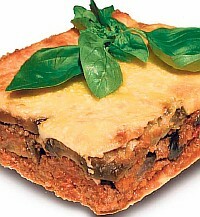 Moussaka can be any dish of layered vegetables and ground meat, and dishes with the same or similar names are prepared in several areas of the world. Other Greek versions call for artichokes, potatoes and zucchini, or a combination, but this is the classic known worldwide. It’s generally served in large portions! Ingredients: 2 medium onions, finely chopped; 6 garlic cloves, finely chopped; 150ml olive oil; 1kg lean lamb mince; 100ml red wine; 2 tbsp tomato purée; 400g chopped tomatoes; 1x1inch piece cinnamon stick; 1 tbsp oregano; 2-3 medium aubergines; 100g butter; 100g plain flour; 700-800ml milk; 100g Parmesan, finely grated; pinch of freshly-grated nutmeg; 2 eggs beaten, ½ tsp mustard powder; salt and pepper to taste. Method: Cook the onions and garlic in 2 tablespoons of the oil in a large frying pan until browned. Add the mince and fry over a high heat for 3-4 minutes. Add the red wine, tomato purée, tomatoes, cinnamon and oregano, and simmer gently for 30-40 minutes, stirring occasionally. Meanwhile, slice the aubergines and brush with olive oil. Fry in batches on both sides in a separate pan until browned. Lay half the aubergine slices over the base of a 2.5-2.75 litre shallow oven-proof dish and season well. Remove the cinnamon stick from the sauce and spoon half of it over the aubergines. Repeat with the remaining aubergines and sauce. Preheat the oven to 200. Melt the butter in a non-stick pan, then add the flour and cook for 1 minute. Lower the heat and gradually beat in the milk until thickened slightly, then simmer very gently for 10 minutes, stirring occasionally. Stir in the cheese and nutmeg, and season. Cool slightly, then beat in the eggs. Pour the topping over the lamb and bake for 30-40 minutes, until golden brown and bubbling. Who Plays Fat And Bald Better – Tom Cruise Or Christian Bale?